Shuttlecock has booked a February gig for you, and while it doesn't fall right on Valentine's Day, we think it'll still make you feel all warm and fuzzy inside. St. Louis emo-shoegaze rockers Shady Bug are coming to Kansas City for the first time and they're playing the Kum-N-Go house. Joining them will be local acts Dead Dads Club, Leg Day, and Tall Boys. 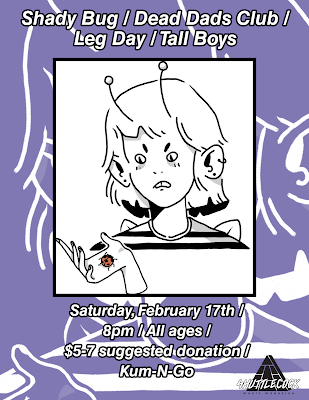 The show is on Saturday, February 17. Doors open at 8pm, it's all ages, and the suggested donation is $5-7. If you need the address, feel free to DM @ShuttlecockMag on social media or email AaronRKC@gmail.com. RSVP, invite your friends, and get links to the bands playing on the Facebook event. See you there!